In the past, dentists had to use fillings made of metal amalgam to restore teeth that were treated for decay. Although metal fillings are effective, they are also highly noticeable, and they can expand or contract with temperature changes. Dr. Jon Marc Van Slate is dedicated to providing his patients with the best-possible care, which is why he only utilizes tooth-colored fillings at his Houston, TX, practice. 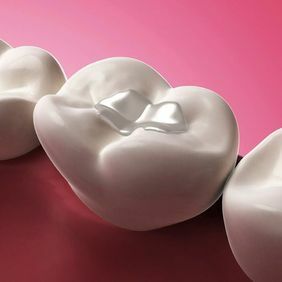 When compared to metal fillings, tooth-colored versions offer a range of advantages, and we can explain them in detail during a personal consultation. Contact our practice today to learn more. When decay is left untreated, it can eventually create cavities on the surfaces of teeth. If oral bacteria reaches the interior of your tooth, it may result in an infection that can only be treated through root canal therapy or extraction. By undergoing routine cleanings and examinations with our team, you allow us to diagnose and treat decay in its earliest stages and then restore your tooth's appearance and function with a dental filling. Made of a special composite material, tooth-colored fillings are available for virtually all patients with basic cavities. When undergoing a routine examination, we will use the innovative DIAGNOdent® device to screen for cavities. The device uses laser technology to detect minor forms of decay that may go unseen by the naked eye. If Dr. Van Slate determines that you require a dental filling, he will first provide anesthesia to ensure your comfort. We utilize the innovative Anutra local anesthetic delivery system rather than a traditional syringe. This system minimizes discomfort by buffering anesthesia, which is a chemical process that neutralizes acids and bases. Made of a special composite material, tooth-colored fillings are available for virtually all patients with basic cavities. Once the treatment area has been numbed, Dr. Van Slate will carefully remove the decayed portions of your tooth. The area will then be reshaped and lightly etched to create an ideal bonding surface. Next, we will carefully apply the composite filling material to your tooth and then use a special light to harden it. The color of composite used will be chosen based on the shade of your natural enamel in order to ensure that your filling blends flawlessly with your smile. To complete the procedure, Dr. Van Slate will remove any excess material and polish the tooth for an attractive and natural-looking result. When compared to traditional metal amalgam types, composite fillings offer several advantages. Most obviously, tooth-colored fillings are incredibly discreet by being virtually indistinguishable from natural enamel. A tooth-colored filling also typically requires the removal of less tooth structure. Since tooth-colored fillings do not contain mercury, they will not expand or contract with temperature changes. Finally, the composite filling material is more durable than metal amalgam and forms a more secure bond. If you have a cavity, a tooth-colored filling can fortify the walls of your weakened tooth, restore dental functionality, and provide protection from future damage. Contact our practice today to schedule an appointment and learn more.